I want to encourage you to nominate your favorites as well. While not everyone can win, being nominated is an honor. It is a small thing that can make someone else very happy! Here is a link to my nominating post from last year. Here is the link to tonight's program. If you right click and open in a new tab you can view it without losing the stream. Below are some science fair project sites. While these are not inclusive, you can still use them to get some ideas. When you have picked out your project make sure you fill out the form below. You will not be allowed to duplicate other ideas so act fast or you may not get to do the project you want. Check out the spreadsheet to make sure your idea hasn't already been taken. BeFunky.com is a picture editor that allows you to put "filters" on your picture. It is a pretty basic editing site for your pictures. Go to the site, upload your picture and try out the different filters. When you have decided on a picture or two, click save and choose download to the desktop. Then you will upload the picture to the class Ning. Plimoth.org is an excellent website filled with great information about the Plimoth Plantation in Plymouth Massachusetts. Since we are a week away from celebrating Thanksgiving in the United States I thought this would be a good time to share the site. One part of the site I would like to share is the You Are a Historian investigation. Here you can learn about both the pilgrim and the Wampanoag. I would suggest you download the web based program to use in class or at home. I am sure that this site will be extremely hard to access for the next week. You can click here to download it. After you unzip it (double click on it) drag out the folder onto your desktop. Go into the folder and open up the webpage that says Start_Here. The page will open up in your default web browser and it will run off your computer. No need to install or to fight slow internet access! Year Two Blog Wants You to Comment! 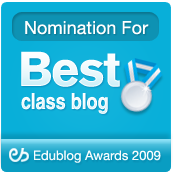 Mr. Sloan from Year Two Blog would like some comments quickly! I made a mistake and forgot to add him to my list for Comments4Kids Wednesday. Please help me fix my mistake and leave a comment on one of the posts! Next is the Lytton Street Jump Jammers from New Zealand. Check out their creative dancing. and leave a comment. This is like a dancing version of the PS22 blog from two weeks ago! Mrs. Blystone's 3rd Grade Blog has a daily recorder that explains what happened in school every day. This is a great idea for a blog! Pick a post and leave a comment. Students will be posting their descriptive essays on the blog soon. The goal of this assignment was to use word choice that "spices up" their writing and makes you understand the place, thing, or person they're describing with all five senses. Are you able to paint a picture in your mind of what they've described? Read a few of the stories and leave a comment or two. On the M9 Daily Diary is a post about a product a couple students created to sell at their school fair. Apparently it is not unusual for students to create and sell products in New Zealand! Leave a comment and tell answer the questions they have asked about the product. This is a quick animation I did to mirror the flip-book my students created yesterday. Since we have been looking at animations I decided they need to make both hand drawn and digital animations. To create the animation we are using Paint on the Windows machine and Tux Paint on the Linux machines. We then insert the individual pictures into Windows Movie Maker to create the "movie". I am not sure what program we will use with our Linux machines. If you have a recommendation it would be much appreciated. I will try to create a how-to video for what we are doing. Cartoonster is a site that teaches you how to animate. It isn't another play with our animations site, it actually shows you how to create your own animations. It is just the place for you to learn how to draw (on paper or using software) your own animations. Your first assignment is to create a flip book of a bouncing ball. After you read through the section explaining how to do it, get it done! Colonial Williamsburg is an incredible living history project. Here is a link to the history of present day Williamsburg. This city holds an incredibly important space in our country's history. George Washington, Thomas Jefferson, John Hancock, and James Madison spent considerable amounts of time there. 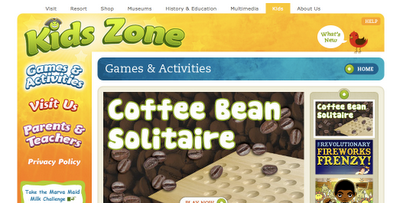 The Kids Zone has a lot of games and activities related to the city and the Colonial Revolution time period. I want you to explore the site and be prepared tomorrow to talk about which of these games and activities would be most beneficial to do in a history class that was teaching this time period. Which ones give you a "feel" for the time period? Which ones could be skipped? Samorost 1: A Point and Click, Critical Thinking, Trial and Error Adventure Game! 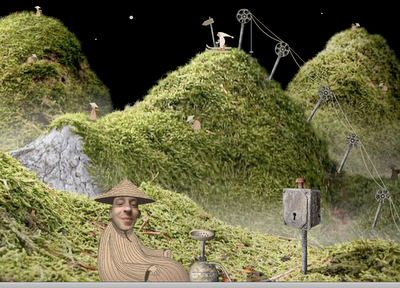 Samorost 1 is a crazy cool game. 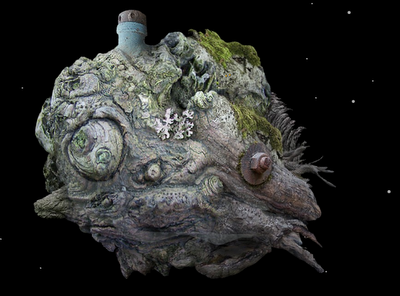 The idea is to get the character, Samorost, to explore the space ship that he finds flying towards his planet. To play this game you simply point and click until you find out how to progress. You will have to collaborate on this one, don't be selfish we you figure out the puzzles! Now for your assignment: I want you to write Samorost's story. Why is scared when he sees the spaceship? Why does he decide to explore it? What does he find along the way? You will need to take notes as you travel with Samorost. You will be posting Samorost's story to the class ning. I will leave you this picture as a clue for the first puzzle. Can you see what has changed? Please note there are different links for students and staff! Make sure you put in the access code correctly. Today we are going to look at BigHugeLabs. Make sure you get your user name and password for me. I want you to make a movie poster for me first. After you create it you need to post it on your blog and the ning. Make sure it is school appropriate. Today you are going to create your own talking avatar at voki dot com. Choose a character, check out the accessories and then type in the text. Don't forget you can change your background as well. Post your Voki to the class Ning. To do that you will need to log in and go to the blog button and create a new post. If you need help ask around. Today you have an unusual opportunity. Public School 22 (PS22) has a very famous student chorus that performs regularly at big events and has been recognized by many famous musicians for their work. 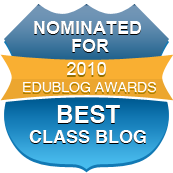 The blog has an incredible amount of content showing the students preparing and performing. I want you to spend time exploring the blog and checking out all the content. 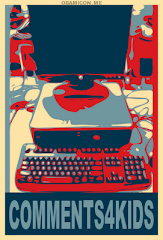 Then I want you to leave a comment. Next we are going to Mr. McClung's class blog to leave him another message. This post is on how his students have showed him how much they care. 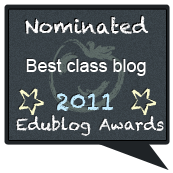 Next we will be visiting New Zealand again and commenting on two blogs from one school, the Yendarra school. The first post will be by the Yendarra School Pukekos. They have just started blogging and will love your encouragement. The second post has two parts. The first part is to read this post on teachers from the school visiting Samoa. Make sure you read my comment. The second part is to read my blog post on the reply I received from Miss Venturi. Incidentally, this is where I first found out about the Pukekos! I want you to leave a comment on their blog. Feel free to ask questions. While doing my usual snooping around for new blogs to read and comment on I came upon this wonderful site, the Yendarra School Kiwis. What caught my eye was a post on several of the teachers of the school visiting Samoa to learn about the island. I also learned from the post that a tsunami had recently hit Samoa. I left a comment asking about the Samoan schools compared to the schools in New Zealand. Soon I received this email. Just thought I would answer the questions you left on our blog about Samoa. First of all, thank you for leaving the comment. My name is Vanessa Venturi and I am the classroom teacher here in Room 14. Yendarra School is in Auckland, New Zealand. The ethnic make up of our school is 70% Pacific Island (mainly Samoan, but also Tongan, Cook Island and Niuean) and 30% Maori (native New Zealanders). Earlier in the year, some of the staff went to Samoa to gain a better understanding of where our Samoan children come from and to better enable ourselves to transition children who move from Samoa to Auckland. What an eye opener! The schools there have little in the way of resources, no equipment, very little paper, some classes had no desks or chairs. Some of the classrooms had up to 45 students and some teachers taught two classes at the same time, just running between two rooms. Because of the heat, the classrooms have no windows. Because of the huge number of children in each class, we didn't see any group work happening. The teachers teach in both Samoan and English. It was amazing to see what they can do with so little, the children were incredibly happy and very proud of their schools. The Samoan people are incredibly musically talented and their performances were stunning. Schools in Auckland are very similar to yours, I would imagine. We have lots in the way of resources, computers, books, internet access, interactive whiteboards, playgrounds etc. We work very hard to be at the cutting edge of education in New Zealand. Visiting Samoa has really helped me to understand where my students and their families come from and relate to them more effectively. We were very lucky that we didn't lose any of our students in the tsunami because we were on school holiday when it hit and many students were at home in Samoa. Families at our school lost a lot of extended family members, auntys, uncles and cousins etc. The other question you had was about karakia, karakia is the Maori word for prayer. At the end of each day, one child stands up and leads the class in a karakia. This isn't something we have to do, but one of my boys asked at the beginning of the year if we could do it and its become a really special way to end each day together. Thanks so much for commenting on our blog, I hope I've answered your questions for you. Please let me know if you have any others! What a wonderful surprise for me. I suspect most people think that most of the learning in school (and especially in my lab) happens with the students. This is obviously not the case today! Again, our ability to communicate and learn from people all over the world is amazing. Thank you Vanessa! GoAnimate is an animation site. After you sign up you will need to verify your email address. Go to your Gmail account and click on the verification link, then sign in. You will need to click on the create button on the top of the page. First you need to read this FAQ (frequently asked questions) , it will explain go points and acceptable use for the site. Of course you won't be creating any offensive animations! I want you to explore the Animation Studio first to check out all the options you have. You will also need to see how you can embed your animation on your blog. Here is a quick demo I created using my favorite fighting character Chun-Li. On Friday we held our annual Fear Factor challenge for the fifth grade. I started this six years when I found I had some extra beef stick and cheese packages that I found to be pretty nasty. As I am wont to do, I solved my problem by having students compete in a contest. It originally was something I did in my homeroom, but the response was so good I expanded to the whole fifth grade the next year. Fear Factor consists of three "tasks" which students have to complete. First we draw three student names from each classroom. (Students are asked first if they would like to participate.) Then I assign them the first task. This year it was a repeat of a task introduced four years ago, wearing their shoes around the neck. Some shoes smell so bad that it can be a difficult task to complete. The second task this year was a variation on something we did last year. During the junior high dance the students had to sing karaoke to Michael Jackson's song "Thriller". Students love to watch the final task, the eating and/or drinking of whatever nasty food we come up with. Finally at the end of the day the remaining contestants had to eat something nasty, Bertie Bott's Every Flavor Bean. 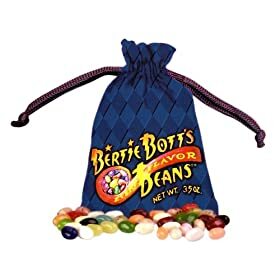 These particular beans came in such wonderful flavors as vomit, soap, and booger. At the end of the bean eating, the students had to drink buttermilk. Treyton won the competition and was crowned this years Fear Factor Champion!